The Chinese dragon is a symbol of power, wealth and wisdom and the dragon dance has been performed since the Han Dynasty 1800 years ago in festivals and celebrations around the world. It requires strength, co-ordination and team work and it showcases the style of the kung fu practitioner. We have 4 dragons - Bruce, the Little Dragon is gold , Jackie, a kid's green dragon, Donnie, our 14 metre long illuminated red fire dragon who is great for night time performances and the longest dragon in Canberra - Jet our 9 person pink competition dragon made in Singapore. Our students love training in dragon dance which involves not only the dancers themselves holding the dragon, but also the bearer of the Pearl of Wisdom and percussionists who symbolise the heart beat of the dragon. Have a look at the photos of our recent performances on our dedicated Canberra Dragon Dance Facebook Page. We were also interviewed by The Canberra Times. 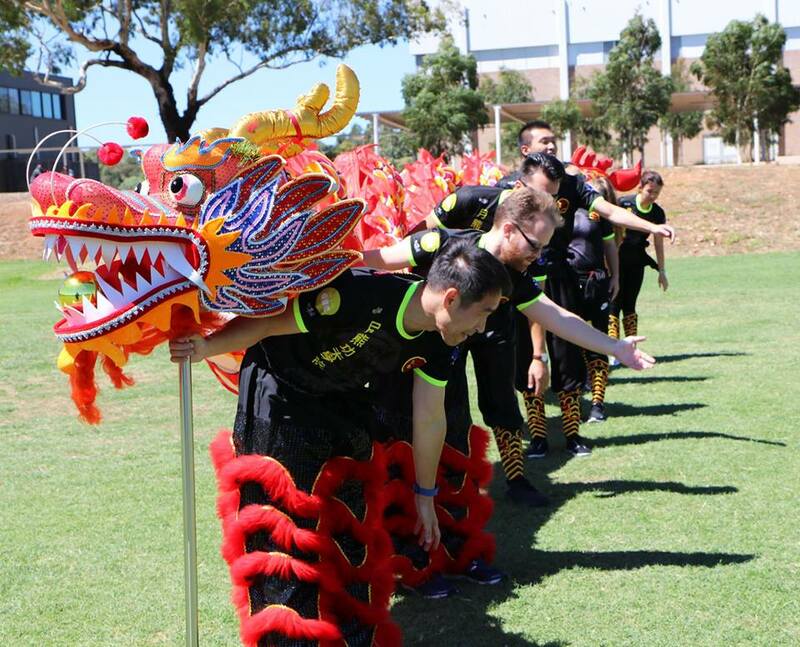 We also train in and perform lion dance and our team of lions have been handcrafted in China just for our academy. Each lion has a name and personality and we pay tribute to the many cultures which made up our academy with names such as Goku, Zhang Ziyi, Wakanda, Purple Rain, Pikachu, Phoenix and many more. Our lions have vibrant colours whilst our LED lions change colour at night time shows. We also have kid's lions for kids not only to train in but to perform in. Lions are frequently used to bless businesses and for celebrations to bring good luck. As much as possible we combine dragon, lion and kung fu performances although sometimes we perform only one of these disciplines. Our dragons and lions are available to perform for events such as festivals, openings, fetes, fairs and private celebrations to bring you good luck and fortune. We also run workshops for the public and for schools to introduce and teach all of our disciplines of martial arts, lion and dragon dance and chinese percussion. And we have many other performances booked in for the rest of the year. Please contact us if you would​ like to book a performance or would like to join our team!